I didn’t have a decent chocolate cake recipe, so I just doubled the recipe I usually use for chocolate cupcakes, it worked out pretty well still. 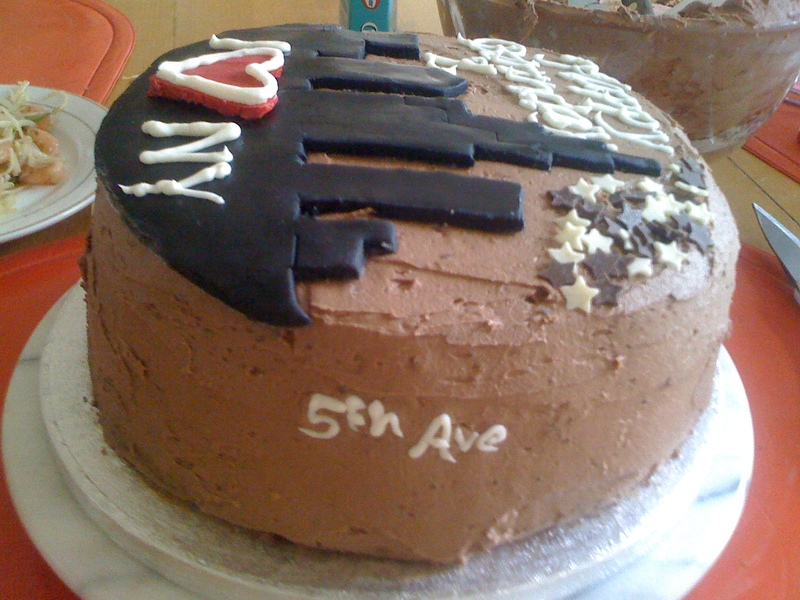 The cake filling is chocolate buttercream, with a couple chocolate stars thrown in! 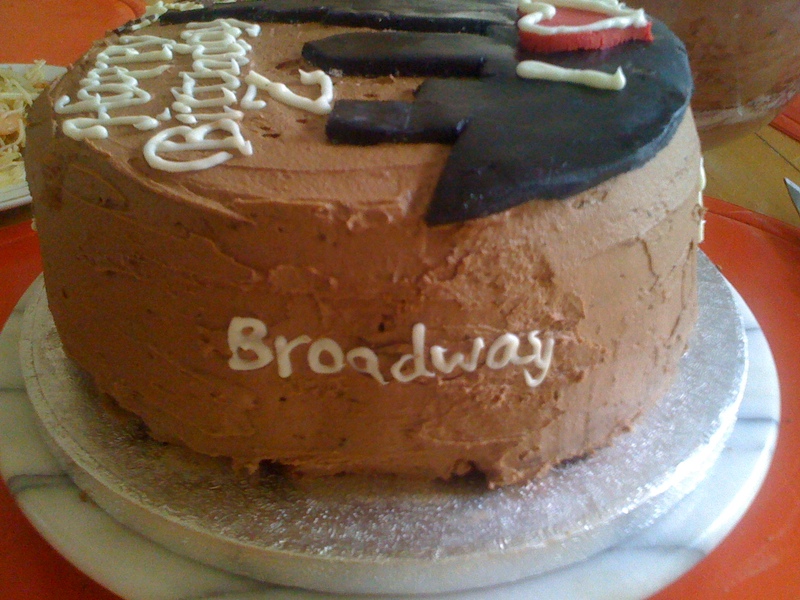 The rest of the cake is also covered in chocolate buttercream – it came out a lot lighter than usual as I mistakenly used milk chocolate instead of plain or dark chocolate – still tasted just the same though! 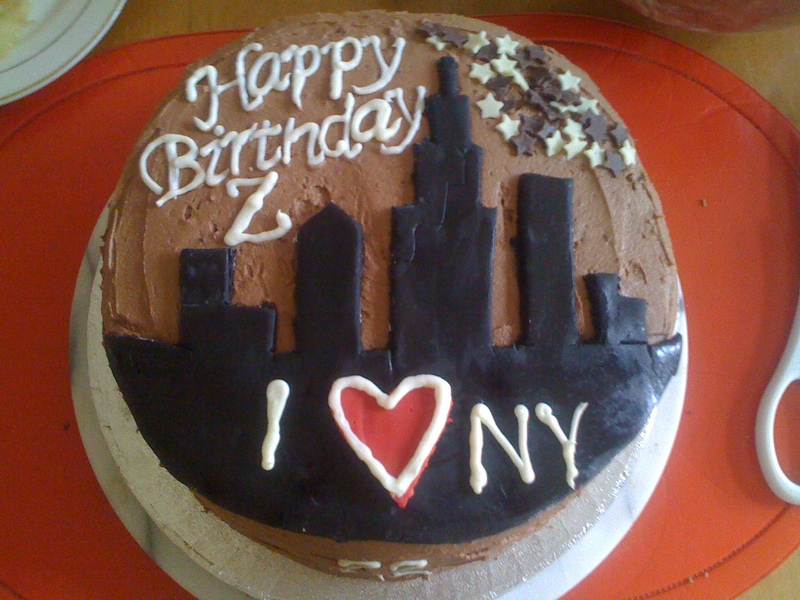 The New York City landscape is made from black fondant icing – I bought a pack in Hobbycraft and just rolled it out, cut it to size and placed it on the cake. 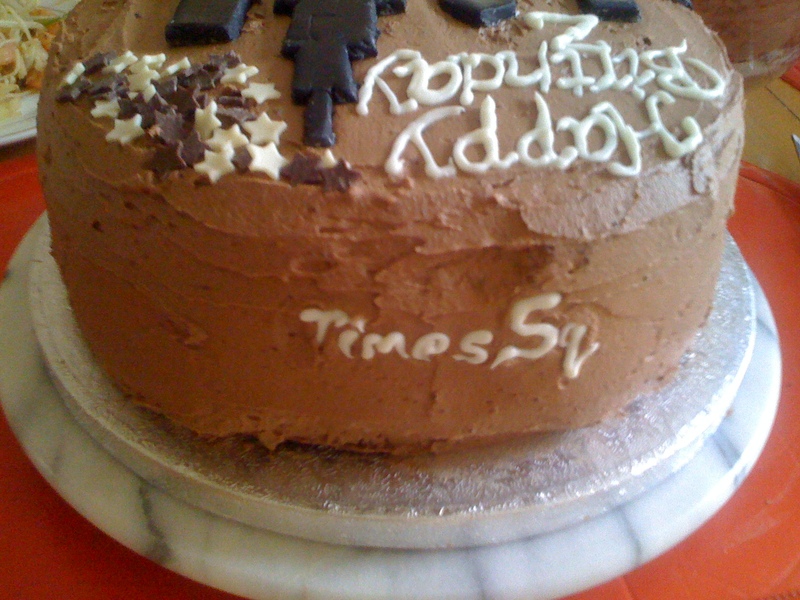 One useful tip is to use icing sugar when rolling out fondant icing – flour does it no good at all! 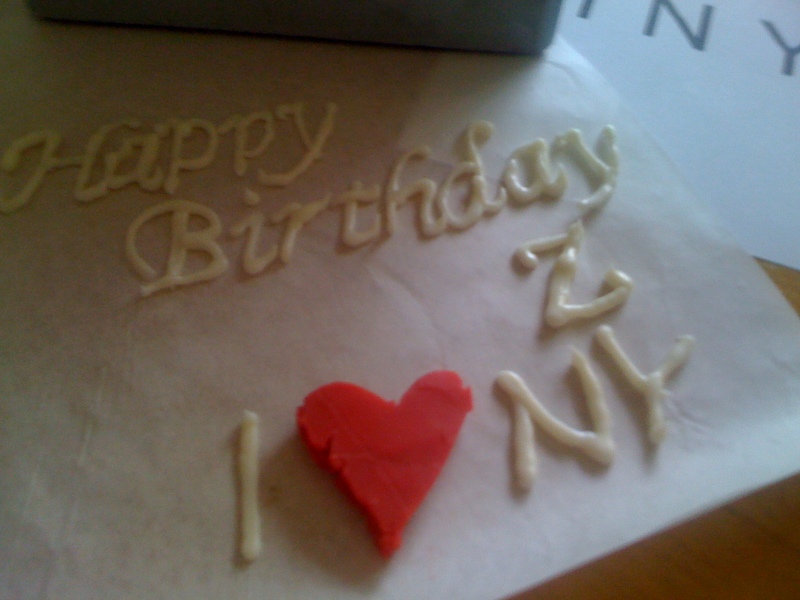 The piping writing actually came out much better than expected – I bought Wilton’s Candy Melts (white chocolate flavour) and melted it down, put it in the piping bag and traced over pre-printed letters with a layer of greaseproof paper on top to make sure the icing would peel off. 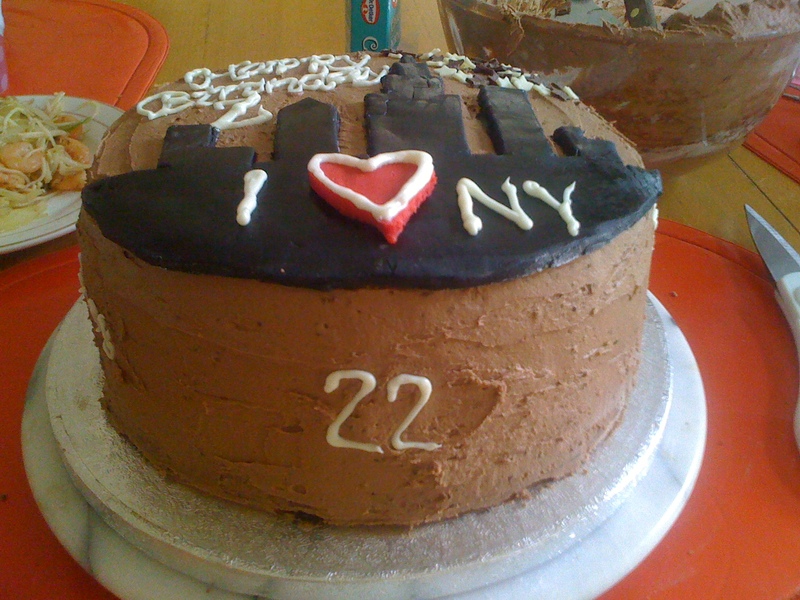 I still need more practice with piping though! The red heart.. originally, I planned on just icing a red heart with the candy melts, as I assumed you could dye it with red food colouring… turns out, liquid doesn’t mix too well with candy melts and turned it into a malleable lump instead! Rather than throw it away, I rolled it out and carved out a heart and left it to set overnight in the fridge!